Mortdecai has a pedigree that most don’t know about and if the Johnny Depp-starring mystery-comedy scores with audiences, there could be more. Mortdecai is based on the book Don’t Point That Thing At Me by Kyril Bonfiglioli and he was also front and center in four comic novels written in the mid to late '70s. But, enough about the potential future, what about today and what about Mortdecai? Depp’s debonair international art dealer has been tasked by MI5 (specifically Ewan McGregor’s Martland) to recover a stolen painting that if it falls into the wrong hands, it could raise a lot of money to cause a lot of problems for the free world. Given that he owes Her Majesty’s Government almost $8 million in back taxes and he faces the possibility of selling inherited valuables from his wife (Gwyneth Paltrow) and his estate, what’s a guy to do? The plot wavers at times and certain things you have to take with a grain of salt as well as just shrugging your shoulders and just go with it. But, this is not a Bond movie. All of the dots don’t have to match up. They just have to form a straight enough line, have a slew of laughs (which Mortdecai does) and feature a few uber-talented performers basking in the joy of the madcap fun. Mortdecai does that. Our expectations may have been low because this is a January release and it hasn’t been promoted all that much. It is surprisingly enjoyable with plenty of action. The big selling part should hardly be a surprise. It’s the palpable panache of its titular character and the star that was born to play him. Depp has his first great role in years and chews the scenery around every corner. Sometimes that doesn’t work so well in terms of one actor commanding the effervesce from a scene. But Mortdecai is a movie that requires it and between Depp’s delightful accent, his silly suaveness and his fantastic comedic chemistry with each and every co-star, Depp delivers exactly as he should. And frankly, we hope the film does find an audience as there are more Mortdecai stories to tell and we wouldn’t mind seeing Depp back as the mustached mystery solving art dealer. Directed with an even hand by David Koepp, the man has cast well and his touch is perfect for this kind of farce. The man who gave us Premium Rush and Stir of Echoes has his first comedy and it turns out, his timing was spot-on. It’s terrific to hear Paltrow in a British accent yet again and Depp too. She and he have a sensational sparring nature that also works for their roles and in this flick. McGregor is perfectly cast as well, although he seems to be trying to chew a few scenes with Depp. The only problem is there is only room for one scene chewer in this particular film. Paul Bettany has a blast as Mortdecai’s man servant/bodyguard, Jock. We haven’t seen the man who will be The Vision in Avengers: Age of Ultron do that much comedy. Judging by what he gives us in Mortdecai, Bettany needs to explore his innate buffoonery more in the future! 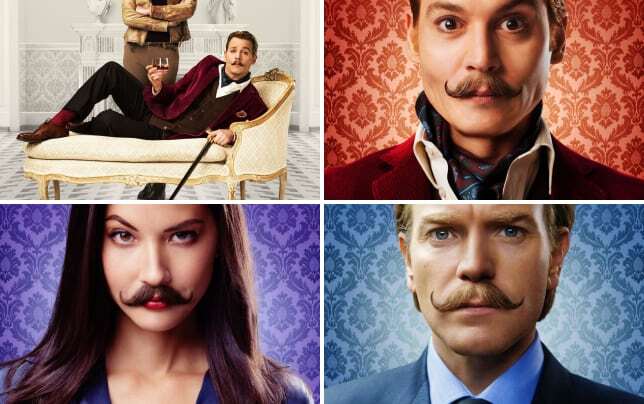 Our Mortdecai review feels that both Koepp and Depp do the best with the script they were given by Eric Aronson. The plot gets quite convoluted at points and there is a moment or two that may have you scratching your head. But, we did leave with a smile on our face.